Then they need to be passaged (dish changed, contacts cut) to start dividing again. With repeated passage, human cells in culture reach senescence after about 50-60 doublings, This is the Hayflick limit, caused by telomere erosion. Around year 2000 it was widely researched what happens when telomeres are restored by expressing human telomerase in the cells (hTERT). "Growth of three independent mass cultures was uniform for ∼150 PDLs after telomerase infection, followed by a progressive acceleration of growth in two of three cultures. Expression of p16INK4A was significantly elevated in the immortalized cells but gradually disappeared during the accelerated growth phase. This alteration correlated with loss of the contact inhibition response and conferred the cells with sensitivity to H-Ras-induced transformation"
hTERT immortalized cells age 10 years epigenetically in just a few months! This might be the key. In some cell cultures cells age more rapidly so they become constrained by the p16Ink4a. p16ink4a is normally silenced by DNA methylation but as age associated hypomethylation progresses , p16 expression increases thus limiting cell division. Later as hypomethylation progresses and genetic instability grows, some cells overcome p16 limitation and become precancerous. In other cultures cells do not age in an accelerated fashion, so they can freely proliferate when telomere erosion is not a limiting factor anymore. There must be some factors in different cell cultures that facilitate slower or faster cellular aging! Mice are also interesting. Mice have much longer telomeres than humans, but live much shorter lifespans. Mouse cells in some culture also stop dividing waaay before reaching the telomere limit. embryo cells without senescence: inhibition by serum. telomeres are the red herring of aging. Telomeres serve as means to prevent differentiated cells to divide too much, to control tissue mass and prevent accumulation of mutations. The tissue stem cells express telomerase in a limited way so that they can escape the Hayflick limit. If it wasnt this way we would run out of blood cells and intestinal epithelial cells pretty soon as these cells have a high turnover. But what really counts is the epigenetic clock. It makes stem cells age, so they lose plasticity and regenerative capacity. p16 becomes more and more expressed with aging cells (epigenetic pattern is inherited by differentiated cells from their parent stem cells) causing senescence and tissue erosion. In cell culture this process can be mimicked with different speeds of biological aging depending on culture media. Lot more research is needed on culture media. Trial and error is not enough. The cellular environment is very important! This is the last research I could find on p16/TERT interplay. In the absence of feeder cells, cultures of human epithelial cells accumulate p16 protein in a passage-dependent manner. This increase in p16 expression eventually leads to growth arrest by telomere-independent mechanisms. There is a growing body of evidence that suggests induction of epithelial cell migration is associated with upregulation of p16 expression (Jung et al., 2001; Natarajan et al., 2003; Svensson et al., 2003; Nilsson et al., 2004; Darbro et al., 2005). Epithelial cell migration happens during embryogenesis. During embryogenesis and young age, the epigenetic clock (developmental program) ticks much faster. Thus certain cell cultures (plastic with serum) mimick embryonic environment and makes the cells age faster. The cell culture with feeder cells - on the other hand - mimicks adult tissue environment thus the epigenetic clock ticks slower. 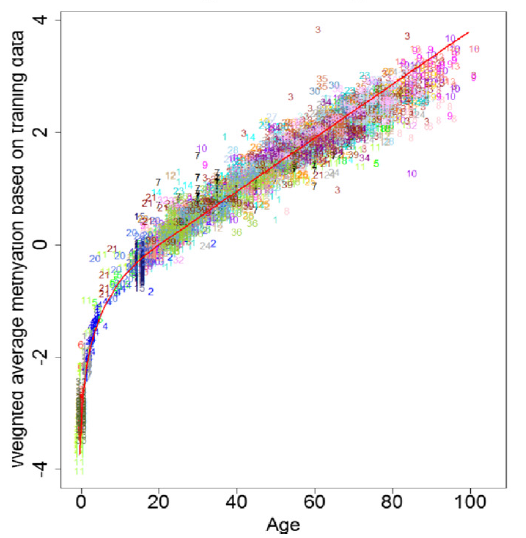 Methylation levels change a lot near birth, much less in adulthood if we apply the embryonic methylation shift in later age, we got a lot more aging in calendar years.